Compression fit leggings from London-based activewear brand, Pepper & Mayne. Combining innovative seamless technology with a lightweight, moisture-wicking construction, the 'Goddess' tights help to keep you cool and dry during workouts. 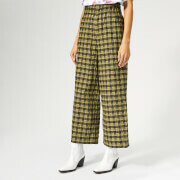 The high waisted style creates a form-flattering silhouette, whilst the compact-spun, space-dye yarn increases durability and creates a textured appearance. Designed with three-quarter length legs and a control waistband to aid posture for enhanced support.